Ghost Ranch is located approximately 38 miles northwest of the town of Española, New Mexico, just north of U.S. Highway 84. Ghost Ranch is run by the Presbyterian Church as a conference center. It has facilities for lodging and camping, as well as paleontology and cultural museums. Ghost Ranch lies in the Chama Basin, a broad shallow basin along the eastern margin of the Colorado Plateau in the transition between the Plateau and the Rio Grande rift. DEM showing the relationship of Ghost Ranch (GR) to the Rio Grande rift and Colorado Plateau. The Colorado Plateau, which occupies parts of New Mexico, Arizona, Utah, and Colorado, has been a relatively stable block in the Earth’s crust for at least 600 million years; consequently the rocks around Ghost Ranch are generally flat-lying and are only mildly deformed by broad-scale folding and localized faulting with stratigraphic offsets of less than 120 feet (36 m). The broadly downwarped Chama Basin formed during compressional Laramide deformation starting about 75 million years ago (Cather, 2004). North to northeast-trending normal faulting associated with the development of the Rio Grande rift, an extensional feature that roughly parallels the course of the Rio Grande between central Colorado and west Texas, affected the area starting about 26 million years ago. The area was mapped by Smith et al. (1961). The 7.5-minute Ghost Ranch quadrangle is currently being updated as a STATEMAP project. The Mesozoic rocks in the breathtaking red, white, and yellow 1300-foot escarpment surrounding Ghost Ranch contain a rich, but fragmentary, geologic record spanning approximately 130 million years of Earth's history. Portions of river systems, vast deserts, saline lakes, broad mudflats, and ocean shorelines are preserved at Ghost Ranch. The oldest rocks exposed at Ghost Ranch belong to the Late Triassic Chinle Group, a thick package of brick-red to red siltstone and mudstone and white to tan sandstone that consist of six distinct rocks units that can be traced around the Chama Basin (Lucas et al., 2005). These rocks were deposited by rivers between 205 and 228 million years ago, when the Ghost Ranch area was located about 10° north of the equator. The basal Shinarump Formation (formerly called Agua Sarca Sandstone) is a white to yellow to green, coarse-grained quartz sandstone that locally contains abundant well-rounded quartzite cobbles; this sandstone is overlain the maroon shales of the Salitral Formation. The Shinarump and Salitral Formations are exposed south of the main Ghost Ranch headquarters along the Rio Chama. On top of the Salitral Formation is a second conglomeratic sandstone – mudstone sequence composed of the Poleo Formation, a medium-bedded, yellowish-gray micaceous sandstone with conglomeratic lenses of siltstone and calcrete clasts, overlain by a thick red to reddish brown mudstone, the Painted Desert Member of the Petrified Forest Formation. In many places, a transitional. thinly-bedded sandstone unit, the Mesa Montosa Member of the Petrified Forest Formation, is present between the Poleo Formation and the Painted Desert Member. The Poleo Formation and Mesa Montosa Member sandstones can be seen along Highway 84 southeast and south of the Ghost Ranch Headquarters. Both of these sandstone-mudstone packages were deposited by large Mississippi River-scale river systems flowing from central Texas toward the northwest to Nevada. Stratigraphic column for the Ghost Ranch area modified from the diagram inside the back cover of the 2005 New Mexico Geological Society guidebook. Thanks to Kate Zeigler for providing this diagram. 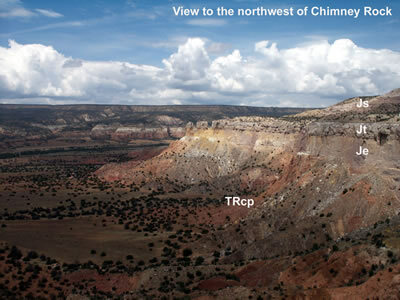 The uppermost part of the late Triassic Chinle Group is exposed in the vicinity of the Ghost Ranch headquarters. Most of the facilities at Ghost Ranch are built on the mudstones of the Painted Desert Member of the Petrified Forest Formation. 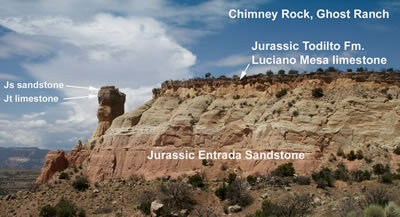 Several of the notable fossil quarries at Ghost Ranch, the Snyder Quarry, Orphan Mesa site, Hayden quarry and the Canjilon phytosaur quarry, are located in this unit at about the same stratigraphic level. The youngest Chinle Group unit, the Rock Point Formation of Lucas et al. (2005), is locally exposed in the escarpment north and east of the ranch just below the conspicuous red and yellow Entrada Sandstone cliffs. The uppermost unit is a thin-bedded red-brown to gray brown siltstone to sandstone. The world-renowned Whitaker quarry, which contains hundreds of skeletons of an early Triassic dinosaur, Coelophysis bauri, is located in this interval (Colbert, 1995). A remarkable accumulation of Coelophysis bauri skeletons was discovered by George Whitaker at Ghost Ranch in the summer of 1947 (Colbert, 1995). Blocks excavated from this quarry have been distributed to museums all over the world. Coelophysis bauri was a bipedal, carnivorous early dinosaur that was generally 6 to 8 feet long, although some adults were as long as 10 feet. The fossil record at the Whittaker quarry is exceptional in that the skeletons display a full spectrum of growth development, ranging from juveniles to fully grown adults, and both genders are represented. Coelophysis was apparently cannibalistic because tiny baby Coelophysis bones have been found in the rib cage of a large Coelophysis (Colbert, 1995). Cannibalism is common among reptiles. No one knows for sure why so many dinosaurs of one species died at once. Usually predators do not congregate unless there is a exceptional food source. Although a few fish and reptile fossils are mixed in with the Coelophysis skeletons, there is nothing to suggest a major food attraction. The skeletons are well-preserved (about 25% are articulated or complete) and show no signs of scavenging, so the animals were buried quickly after death. The leading hypothesis that is consistent with both the fossil and sediment record at the quarry is that the animals were killed by a flood, washed into a low spot or pond, and immediately buried (Colbert, 1995). A bone bed in the Late Triassic Painted Desert Member of the Petrified Forest Formation that contains a diverse group of land and water-based animals, aquatic invertebrates, and abundant charcoal was found by Mark Snyder in 1998 (Heckert and Zeigler, 2003). Phytosaurs, two genera of aetosaur, a rauisuchian, an amphibian, an Eucoelophysis, and thousands of fish scales have been recovered from the quarry (Zeigler, 2005; Zeigler et al., 2005). Phytosaurs, a common fossil found at Ghost Ranch, were crocodile-like, scale-covered, reptiles up to 20 feet long that lived in rivers and lakes. Phytosaurs had a long, narrow head with nostrils just in front of the eyes. Aetosaurs, another common Ghost Ranch fossil, were 10-foot-long, armored reptiles with a crocodile-like body and a pig-like snout that also liked to live near water. The bonebed is in a 1 foot thick conglomerate containing mudstone rip-up clasts. The bones and wood are aligned, but not abraded, so transport in flowing water was minimal (Zeigler, 2005; Zeigler et al., 2005). The skeletons are mostly disarticulated, but there are no signs of scavenging or weathering, so burial occurred shortly after death. The ten phytosaur skulls found at Snyder quarry range fro 1 foot to 3 feet in length, indicating that juvenile to adults were present in the assemblage; young adult were the most common. Zeigler (2005) has proposed that the animals were killed by a wildfire through a combination of asphyxiation and high temperature, that the decaying carcasses were not at the surface very long, and that the animals were buried during the rapid sedimentation that often occurs after a wildfire. The Hayden Quarry was found in June, 2002, near the entrance gate to Ghost Ranch at the same stratigraphic level as the Snyder quarry (Downs, 2005). Like the Snyder quarry, the bones are black, and carbonized wood is abundant. The most common skeletal fragments found so far belong to phytosaurs and aetosaurs. Bones from two dinosaurs, one small and one large, have been found (Heckert et al., 2000). The quarry is still under development (Downs, 2005). Charles Camp from the University of California Museum of Paleontology excavated this quarry in 1928, 1930, and 1933. This quarry is at the same stratigraphic level in the Chinle Group as the Snyder and Hayden quarries. The degree of articulation of the skeletons is better at this quarry, but the diversity of the fauna is lower compared to the Snyder quarry (Martz and Zeigler, 2005). Like the Snyder quarry, phytosaurs are the most common fossil; the eleven skulls found here are mostly young adults, but juveniles and larger adults are also present (Zeigler et al., 2005). Aetosaur and and few metopsaur bones have been found. 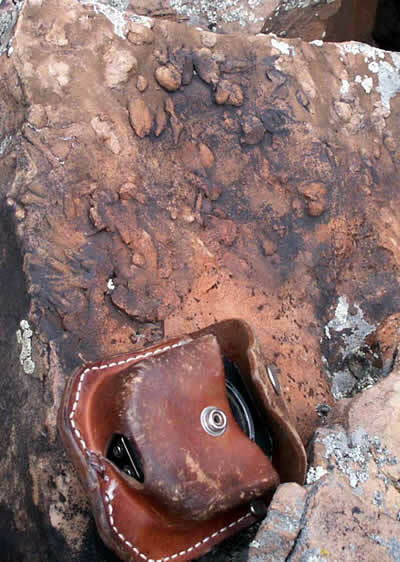 No charcoal has been found at this quarry, but silicified wood interpreted to be pyrofusinite, which forms by fire, is common (Zeigler et al., 2005). 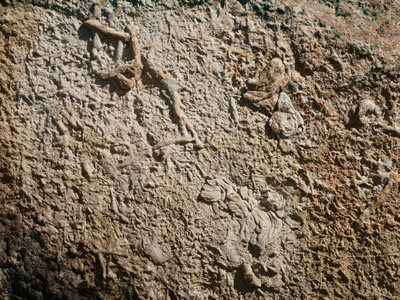 Several fossils have been found around Orphan Mesa, including a partial Euceolophysis baldwini dinosaur fossil (Sullivan and Lucas, 1999) and parts of phytosaurs (Sullivan et al., 1996). A significant gap in the rock record (unconformity) spanning about 44 million years occurs between the late Triassic rocks and the Middle Jurassic rocks at Ghost Ranch. The oldest of the Middle Jurassic rocks, the Entrada Sandstone, forms the prominent red, yellow, and white cliffs just above Ghost Ranch. The Entrada Sandstone contains spectacular cross-beds that are several feet high, indicating an eolian (wind-blown sand) origin for this unit. The Entrada Sandstone deposits at Ghost Ranch are part of a vast dune field that covered much of northern New Mexico, southwestern Colorado, southeastern Utah, and northeastern Arizona (Korurek and Dott, 1983; Blakey, 1994; Peterson, 1994). Paleocurrent indicators show that the Entrada sands were transported by wind blowing toward the south to southwest (Tanner, 1965). The Entrada sandstone is estimated to be approximately 161 to 165 million years old. View from Chimney Rock trail toward Chimney Rock. Js is basal Jurassic Summerville sandstones and Jt is Jurassic Todilto. TRcp is Triassic Petrified Forest Formation of the Chinle Group, Je is Jurassic Entrada Sandstone, Jt is Jurassic Todilto Formation, and Js is Jurassic Summerville Formation. The Todilto Formation, which consists of a basal limestone and shale unit (Luciano Mesa member) and, in places, 25 to 100 feet of gypsum (Tonque Arroyo member), was deposited on the Entrada Sandstone. Locally, a thin bed of limestone sits on the gypsum. The contact between the Entrada Sandstone and the Luciano Mesa limestone member of the Todilto Formation is relatively flat and quite sharp, which has led Ahmed Benan and Kocurek (2000) to speculate that that the Entrada dune field was flooded catastrophically, with very little reworking of the sand dunes. The Todilto Formation was most likely deposited in a salina (Lucas et al., 1985); in other words, in a moderately deep, oxygen-poor, body of saline water that was isolated from the main body of the Jurassic ocean by a barrier. First, limestone precipitated from the evaporating sea water. Anderson and Kirkland (1960) noted that the basal limestone was deposited in thin layers, with each layer consisting of limestone, clay, and dark organic material. Each layer, or varve, represents a one year cycle related to seasonal variations in runoff, water temperature, and abundance of lake organisms. Anderson and Kirkland (1960) carefully counted the varves and found that it took 14,000 years for the basal laminated limestone to accumulate. Two fossil fish have been found in the limestone of the Luciano Mesa Member adjacent to the Chimney Rock trail at Ghost Ranch (Hunt et al., 2005). Later, as the saline waters of the salina became more concentrated by evaporation, gypsum precipitated. The Todilto Formation, based on fossil evidence (Lucas et al.,1985) is approximately 159 million years old. The Todilto Formation grades up into the Summerville Formation. The basal 25 to 40 feet of the Summerville Formation is tabular white to tan sandstone interbedded with green to red mudstone and shale. Limestone is interbedded with the basal Summerville Formation toward the west. Ripple marks and casts of gypsum crystals are common in the basal Summerville sandstone. The basal sandstone unit is overlain by a thick section of maroon mudstone and pinkish-tan, poorly cemented sandstone deposited on an arid coastal plain (Lucas et al., 1998). Pedogenic carbonate is common in the maroon mudstone, particularly near the top of the unit. The Bluff Sandstone, which is exposed near the top of the Summerville Formation, represents a return to eolian (wind-blown sand) deposition in this area. Cross-beds in the Bluff Sandstone record winds blowing toward the east, suggesting that the Ghost Ranch portion of the North American continent had drifted north into the zone of prevailing westerlies (Lucas and Anderson, 1998). An unconformity between the Summerville Formation and the overlying Morrison Formation marks a time of a major plate tectonic reorganization of the southwestern United States and a shift from an arid to a more humid environment in this region (Lucas and Anderson, 1998). The Brushy Basin member of the Morrison Formation, the only member of the Morrison Formation present at Ghost Ranch, is made of pistachi-green to salmon-pink mudstone with a few interbedded tan and green sandstone beds. The Morrison Formation was deposited by rivers flowing toward northeast across a broad, fairly low-gradient muddy floodplain that dipped toward the north to northeast away from the developing Mogollon highlands in southwestern New Mexico and southeastern Arizona. Dinosaurs roamed these floodplains. A few fragments of dinosaur bone, including one femur, have been found north of Ghost Ranch (Heckert et al., 2005). Radiometric dating of ash beds (40Ar/39 Ar on sanidine; Kowallis et al., 1998) in the Brushy Basin member in Utah and Colorado yields ages of 148 to 150 million years for this unit. View of the Upper Jurassic and Cretaceous rocks northeast of Ghost Ranch. Jmb is the Jurassic Brushy Basin Member of the Morrison Formation. Kbc is the Cretaceous Burro Canyon Formation, which is unusually thick here. 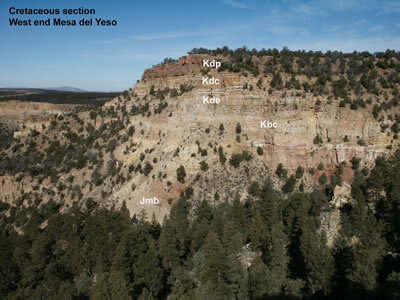 Kde, Kdc, and Kdp are the Encinal Canyon, Cubero,and Paguate sandstone members of the Dakota Sandstone, respectively. The mesas around Ghost Ranch are capped by Cretaceous coastal plain, shoreline and marine units that were deposited along the western margin of the Western Interior Seaway ~93 to 125 million years ago. Approximately 25 million years of Earth's history is missing across the contact between the Late Jurassic Morrison Formation and the Early Cretaceous Burro Canon Formation. The Burro Canyon Formation consists of cross-bedded medium to fine-grained sandstone, quartz and chert pebble conglomerate, and pale-green to pale-red mudstones (Ridgley, 1977; Ridgley 1987; Owen et al., 2005). The unit was deposited by braided streams flowing across a coastal plain towards the northeast to north, toward the Western Interior Seaway. This unit is about 100 to 125 million years old (Owen et al., 2005; Varney, 2005). Burrows in the Paguate Member of the Dakota Sandstone. Brunton compass in the photograph shown for scale . The Dakota Sandstone is composed of interbedded tan- to yellow brown-weathering sandstone and dark gray carbonaceous shale and siltstone. Ripple marks on tops of sandstone beds are common. The sandstones are locally cross-bedded, but, in general, the sandstones were intensely burrowed by marine organisms living in the shallow water along the shores of the Western Interior Seaway. Burrows are structures in sedimentary rocks formed by organisms digging or moving through sediment when the sand or mud was soft; organisms burrow through sediments seeking shelter, protection, or food. The Dakota Sandstone records the alternating rise (shale) and fall (sandstones) of sea level as the shoreline moved back and forth across the area~ 98 to 100 million years ago. Gradual, long-term rise in sea level deposited rocks of the Graneros Shale of the Mancos Group, a mud deposited on a shallow ocean floor about 98 million years ago. Burrows in the Paguate Member of the Dakota Sandstone. The area shown in the photograph is about 3 feet across. The youngest units exposed around Ghost Ranch are Quaternary terrace and pediment gravels along the drainages, and extensive landslide and colluvial deposits along the escarpment. Many of the terrace gravels contain quartzite,granite, and metavolcanic rocks that likely was derived from the Tusas Mountains to the northeast of Ghost Ranch, either directly from the Proterozoic rocks in the Tusas Mountains, or from clasts recycled out of the Tertiary El Rito Formation on the west flank of the mountain range. Ahmed Benan, C.A. and Kocurek, G., 2000, Catastrophic flooding of an aeolian dune field: Jurassic Entrada and Todilto formations, Ghost Ranch, New Mexico, USA: Sedimentology, v. 47, p. 1069-1080. Anderson, R.Y., and Kirkland, D.W., Origin, varves, and cycles of Jurassic Todilto Formation, New Mexico: Bulletin of the American Association of Petroleum Geologists, v. 44, p. 37-52. Blakey, R.C., 1994, Paleogeographic and tectonic controls on some Lower and Middle Jurassic erg deposits, Colorado Plateau. In: Caputo, M.V, Peterson, J.A., Franczyk, K.J. (Eds. ), Mesozoic Systems of the Rocky Mountain Region, USA. Rocky Mt. Sect., SEPM (Soc. Sediment. Geol.). Denver, pp. 273-298. Cather, S.M., 2004, The Laramide orogeny in central and northern New Mexico and southern Colorado, in Mack, G.H., and Giles, K.A., eds., The Geology of New Mexico, A Geologic History: New Mexico Geological Society Special Publication 11, p. 203-248. Colbert, E.H., 1995, The little dinosaurs of Ghost Ranch: Columbia University Press, New York, 247 pp. Downs, A., 2005, The Hayden Quarry, a new Upper Triassic fossil locality at Ghost Ranch, New Mexico, New Mexico Geological Society Guidebook 56, p.355-356. Heckert, A.B., Zeigler, K.E., Lucas, S.G., Rinehart, L.F., and Harris, J.D., 2000, Preliminary description of coelophysoids (Dinosaruia: Theropoda) form the Upper Triassic (Revueltian: early-mid Norian) Snyder quarry, north-central New Mexico: New Mexico Museum of Natural History and Science, Bulletin 17, p. 27-32. 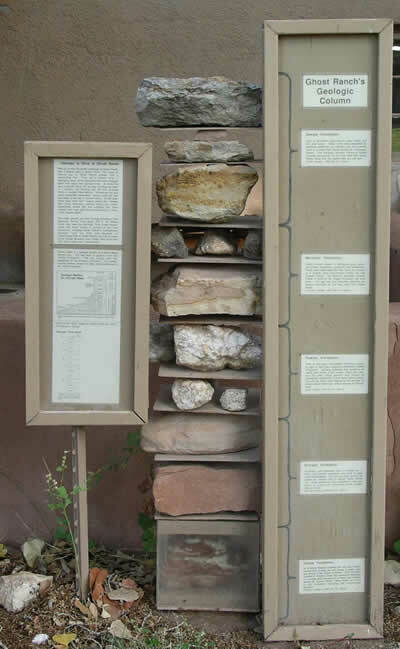 Heckert, A.B., and Zeigler, K.E., 2003, The Late Triassic Snyder quarry: a brief history of discovery and excavation, New Mexico Museum of Natural History and Science, Bulletin 24, p. 5-13. Heckert, A.B., Lucas, S.G., Downs, A., and Hunt, A.P., 2005, Fossils at Ghost Ranch: The Ruth Hall Museum of Paleontology Collection: New Mexico Geological Society Guidebook 56, p. 40-41. Hunt, A.P. Lucas, S.G., and Downs, A., 2005, A new fossil fish locality in the Middle Jurassic Todilto Formation at Ghost Ranch, north-central, New Mexico: New Mexico Geological Society Guidebook 56, p. 45. Kocurek, G. and Dott Jr., R.H., 1983. Jurassic paleogeography and paleoclimate of the central and southern Rocky Mountains region. In: Reynolds, M.W., Dolly, E.D. (Eds. ), Mesozoic Paleogeography of the West-Central United States. Rocky Mt. Paleogeogr. Symp., vol. 2. Rocky Mt. Sect. SEPM (Soc. Sediment. Geol. ), pp. 101-1 16. Kowallis, B.J., Christiansen, E.H., Deino, A.L., Peterson, F., Turner, C.E., Kunk, M.J., and Obradovich, J.D., 1998, The age of the Morrison Formation: Modern Geology, v. 22, nos. 1-4, p. 235-260. Lucas, S.G., Kietzke, K.K., and Hunt, A.P., 1985, The Jurassic System in east-central New Mexico: New Mexico Geological Society Guidebook 36, p. 213-243. Lucas, S.G., and Anderson, O.J., 1998, Jurassic stratigraphy and correlation in New Mexico: New Mexico Geology, v. 20, p. 97-104. Lucas, S.G., Hunt, A.P., and Spielmann, J. , 2005, Jurassic stratigraphy in the Chama Basin, northern New Mexico: New Mexico Geological Society Guidebook 56, p 170-181. Lucas, S.G., Zeigler, K.E., Heckert, A.B., and Hunt, A.P., 2005, Review of Upper Triassic stratigraphy and biostratigraphy in the Chama Basin, northern New Mexico: N ew Mexico Geological Society Guidebook 56, p. 182-192. Martz , J.W., and Zeigler, K.E., 2005, Taphonomy and sedimentology of the Upper Triassic Canjilon Quarry (Painted Desert Member of Petrified Forest Formation, Chinle Group), Chama Basin, north-central New Mexico, and a comparison with the Snyder Quarry: New Mexico Geological Society Guidebook 56, p. 41-43. Owen, D.E., Forgas, A.M., Miller, S.A., Stelly, R.J., and, Owen, D.E., Jr., 2005, Surface and subsurface stratigraphy of the Burro Canyon formation, Dakota Sandstone, and intertongued Mancos Shale of the Chama Basin: New Mexico Geological Society Guidebook 56, p. 218-226. Ridgley, J.L., 1977, Stratigraphy and depositional environments of Jurassic to Cretaceous sedimentary rocks in the southwestern part of the Chama Basin, New Mexico: New Mexico Geological Society Guidebook 28, p. 153-158. Ridgley, J.L., 1987, Surface to subsurface cross sections showing correlation of the Dakota Sandstone, Burro Canyon (? ), Formation, and upper part of the Morrison Formation in the Chama-El Vado area, Chama Basin, Rio Arriba County, New Mexico: U.S. Geological Survey Map MF1496-D, 2 sheets. Peterson, F., 1994. Sand dunes, sabkhas, streams, and shallow seas: Jurassic paleogeography in the southern part of the western interior basin. In: Caputo, M.V, Peterson. J.A., Franczyk, K.J. (Eds. ), Mesozoic Systems of the Rocky Mountain Region, USA. Rocky Mt. Sect., SEPM (Soc. Sediment. Geol. ), Denver, pp, 233-271. Smith, C.T., Budding, A.J., and Pitrat, C.W., 1961, Geology of the southeastern part of the Chama Basin: New Mexico Bureau of Mining and Mineral Resources Bulletin 75, 57 pp. Sullivan R.M., Lucas, S.G., Heckert, A.B., and Hunt, A.P., 1996, The type locality of Coelophysis, a Late Triassic dinosaur from north-central New Mexico (U.S.A.): Palaontologische Zeitschrift, v. 70, p. 245-255. Sullivan, R.M., and Lucas, S.G., 1999, Eocoelophysis balwini, a new theropod dinosaur from the Upper Triassic of New Mexico, and the status of the original types of Coelophysis: Journal of Vertebrate Paleontology, v. 19, p. 81-90. Varney, P., 2005, Dakota outcrop geology and sequence stratigraphy, Chama Basin, New Mexico: New Mexico Geological Society Guidebook 56, p. 193-217. Zeigler, K.E., 2005, The Snyder Quarry: A fire-related Upper Triassic fossil assemblage in north-central New Mexico: New Mexico Geological Society Guidebook 56, p. 48-50. Zeigler, K.E., Heckert, A.B., and Lucas, S.G., 2005, Taphonomic analysis of a fire-related Upper Triassic vertebrate fossil assemblage from north-central New Mexico: New Mexico Geological Society Guidebook 56, p.341-354.